You know that nightmare where you walk into work only to realize you're wearing nothing at all? Well, you might think that working in fashion, the nightmare is more like showing up wearing the same thing as your co-workers. But as it turns out, you'd be wrong. Around the Who What Wear digs, we've all fallen in love with one trend this fall: plaid blazers. While the team is divided between L.A. and New York, with one editor all the way in Raleigh (Hi, Allyson! ), we've all gravitated toward this polished staple. We've argued the merits of each brand's take during our editorial meetings and shown up to events matching head to toe. Though we're a bicoastal bunch, it seems that we're all on the same wavelength. Below, we're breaking down the plaid blazer each editor is wearing right now. Then, we're shopping out a few styles so you too can join the Who What Wear clique. "This is the one blazer that makes me feel powerful and confident. The plaid is on trend and timeless, and I love the structured fit." "I love this Anine Bing blazer, which is so soft and fits me nicely with no alterations. The shape is slightly oversize but still flattering, which I love. I paired it with a simple T-shirt and jeans, along with white boots by Mango and our own Who What Wear collection bag. If I swapped out a new bag and shoes, I could definitely wear this look for the next 10 years." 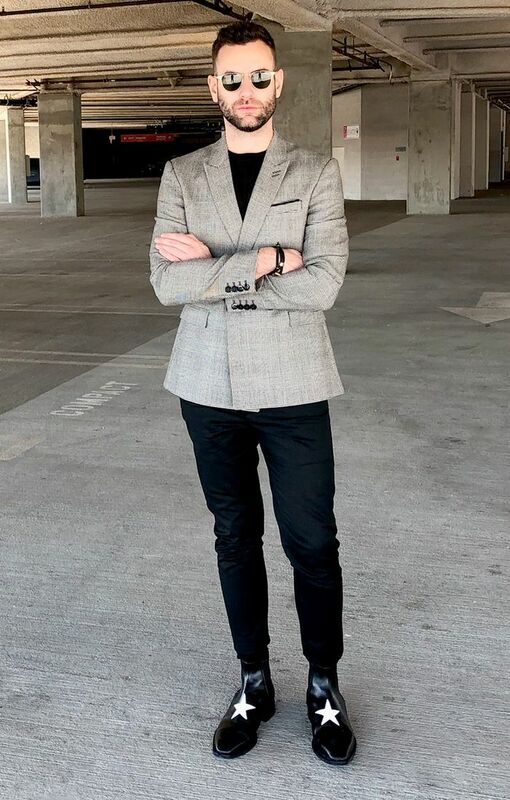 "If we're being honest, I bought this Zara blazer because my top three choices (Tibi, Anine Bing, and Isabel Marant) were and still are all sold out. Nonetheless, I've decided to stick with it despite it fitting a little big (in case you're wondering, I'm 5'2" and wearing an XS), because, well, it was $70, does the job, and if this trend decides to fizzle out sooner than expected, I'll be really happy with my lower-priced choice. I styled it with what I wear pretty much every other day: jeans and a tee. If we're getting specific, Krewe Ward sunglasses, my go-to Brandy Melville T-shirt, Citizens of Humanity x Wilfred black jeans, and Hermès block-heel sandals. I'd say it makes for a foolproof go-to transitional outfit." "I love the oversize, boxy feel of this blazer. It's heavy enough that I can wear it all the way into winter, and I like that the plaid is more muted, which makes it great for wearing with statement pieces like these boots." "I got this blazer from Reformation last season and have worn it more times than I can count—it's linen and insanely comfortable. I usually wear it with all black, like this Zara jumpsuit (that's even more comfortable than the blazer). To dress it up a bit, I went with a pair of kitten-heel mules and my new burgundy Kozha Numbers bag." "This Zara option gets the job done. The fit isn't great; I'm wearing an XS, and it's still pretty oversize. (My co-workers guessed I was wearing a medium if that gives you a better visual.) It was only $70, so I'm content with it. I dressed down the blazer look by pairing it with a graphic tee and light-wash jeans." "I actually bought this blazer early in the summer and have been wearing it a variety of ways ever since. Here, I paired it with a white T-shirt, black skinny jeans, and red statement boots, but I also love wearing it with silk slip skirts, under camel coats when it's cold enough, and over a cool street-inspired hoodie." "While I love this fall's oversize, slightly '80s blazer trend, I haven't really dipped my toes into full suiting just yet. Pairing my blazer with a black-on-black trouser-and-tank combo is about as coordinated as I get. It's still sharp but not quite as formal as something matchy-matchy." "I can get behind any trend that's in line with my personal style, and checked blazers are no exception. I've been wearing one as part of my everyday uniform with a T-shirt, jeans, Chanel slingbacks, and gold jewelry. I've been gravitating to menswear-inspired versions like this one from Majorelle. In my opinion, the coolest way to wear a blazer this season is an oversize style that looks like it was borrowed from a man's closet." An oversize plaid would go well with leather. An extra-long blazer is a cool twist. Balenciaga's hourglass blazer was a street style favorite. Our editors love Zara's affordable blazer. Simple and oh so easy. Wear this blazer with a sleek turtleneck. This blazer has a cool, preppy vibe. Found: the French-girl take on plaid. Style this checked blazer with jeans. This Reformation blazer is oh so cool. Want more fall trends? Here's how to wear over-the-knee boots.